I am not sure anymore how often it happened, but I heard it quite often. It usually goes like “Wow, you can play guitar solos, you must know a lot about music theory”. Friends said that often, or I had people asking on my YouTube videos what type of scales I would use in my solos. The reality? I have no clue, and I couldn’t care less. I don’t want to analyze music, I want to make music. Usually when I said something like this, the next reply would be “But how did you learn to play the guitar if you don’t know what you are playing?”. My counter question is usually “As a kid, how did you learn to cycle on your bike if you mother didn’t give you a 500 pages handbook about physics, sports and medicine?”. Right, you didn’t need that, it was sufficient enough to fall on the snout a couple of times, but then you finally managed it to cycle your bike. The human brain is pure magic. This is exactly how you learn what type of notes fit to what type of chords. With the guitar you don’t have to fall on the snout, you have to play crap until it doesn’t sound like crap anymore. Of course, you will need a bit of basic theory, like how are the chords called that I play? But some people have a very complicated impression about learning the guitar. You don’t need to know every single note across the whole fretboard to be able to play guitar solos. It might be very cool if you manage it to do that, but in reality you’re just wasting time while everyone else is starting to hit the notes instead of learning their names. Yes, you can learn all scales, pentatonics or however all the stuff is called, but I’ve met a person who did that. He could play those scales, but that was all. Did he manage it to leave those patterns? No, he didn’t, he was really just doing that, playing all those fancy scaled and patterns you know from theory books. But that’s not how music is made. It sounds boring if all what you can do is playing certain patterns up and down, that’s very monotonous. You won’t be able to get creative if you waste all your time on theory and if you don’t grab your instrument. 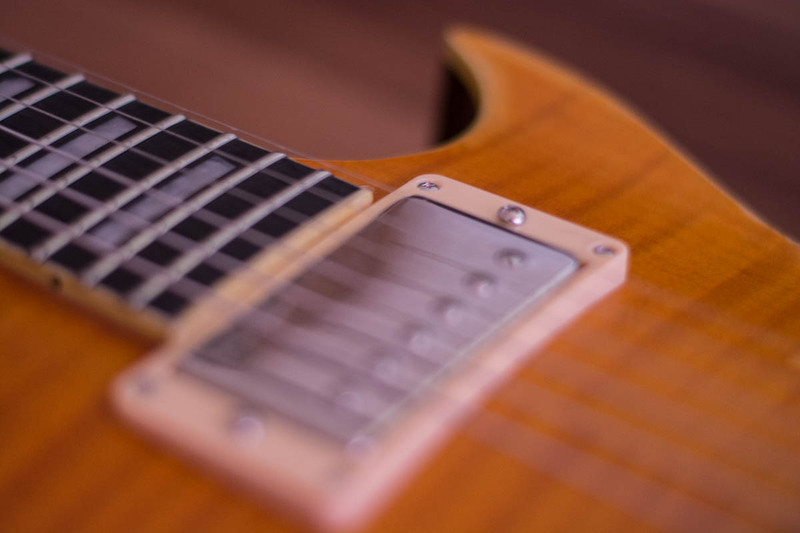 Learn the basics, but don’t forget to grab the guitar and start playing it. It doesn’t matter if it sounds bad, if you keep doing it, it will sound better. Our human brain is pure magic, it can discover scales and pentatonics without even knowing that there are names for it in music theory. I just discovered many years later that I was playing minor or major pentatonics all the time. How cool is that? The stuff has a name? Fine! You maybe get my point. Start using the guitar, and yes, it’ll make sense to learn a bit more about theory later, because out of the sudden many things will at least get a name, and some things might even make more sense when you see it on paper. But if you do this too early, you won’t become a player. I don’t know why so many people have the impression that you need to dive deep into theory to be able to play guitar solos. You just need the guitar, because you have ears and hands, so start putting these hands on the fretboard and try stuff out. Listen to songs and take your guitar and start to experiment what type of notes fit to the song you’re listening to. Put the radio on, and start hitting notes on your guitar. Unless you’re very tone-deaf, you will discover on your own in what situations certain notes fit or not. And yes, even after discovering it you will still hit the wrong notes. But that’s how our brain works, it stores information’s when you repeat things again and again, and at some point you will be surprised that you start hitting the right notes. The advantage? You become a person that does play by the ear, that’s a huge advantage over those who prefer to become real theory nerds. Don’t be the kid that needs a book to be able to ride a bike. Again, don’t get me wrong, it totally makes sense to take a look at scales and so on, it’s just when it’s all what you are doing, you won’t get very far. You don’t get the ability to play the guitar from theory alone, you need to use your guitar. And you need to train your ear, because this is something that no book can teach you. It’s all about your brain, and muscle memory. You need to play to get better. So, if you ask me, set a high focus on playing, and take a look at theory much later or if you really want it now, then just in addition. You don’t believe me that there are guitarists that can tell you everything about theory but that actually can’t play the guitar? Again, I’ve met people of this category several times in my life. They can analyze everything that fits in a certain concept they learned about, but that’s about all they can do, because apart from that they’re pretty much lost. Don’t be that person! Trust your ears, your hands and your brain. Be the person that can start playing a solo without knowing what’s going on. It’s much better to play by ear, because then you won’t be limited to any patterns you find in books or in the internet. You can still later take a look, to maybe connect the dots and get some “Aha!” moments. That’s fine, and my suggested path. 🙂 That is very easy for you, Dennis. You were probably a musician in a past life. I think the guitar is pretty much like a puzzle. If someone takes a look at one and the same puzzle pieces again and again, and if it is put together again and again. It will be put together faster and faster with each new try. I think that is the case with every activity or skill that can be performed or learned. I was inspired to create this article because I realized today so many newbie guitarists ask highly theoretical questions, but they have difficulties to actually try (and discovering) things on their own. That’s something I don’t understand. It’s actually very dangerous, because that’s preventing them to get creative, to think or try stuff outside of the box. The ear is very important, no book can train the ear or hands. With that said, trying and practicing is much more important than theory.